Place of no return, where it all began. Golf ghosts. From Poway to San Ramon, the legacy of Escondido Country Club played through this week. Not coincidentally, the controversial Michael Schlesinger was at the center of the storm(s). 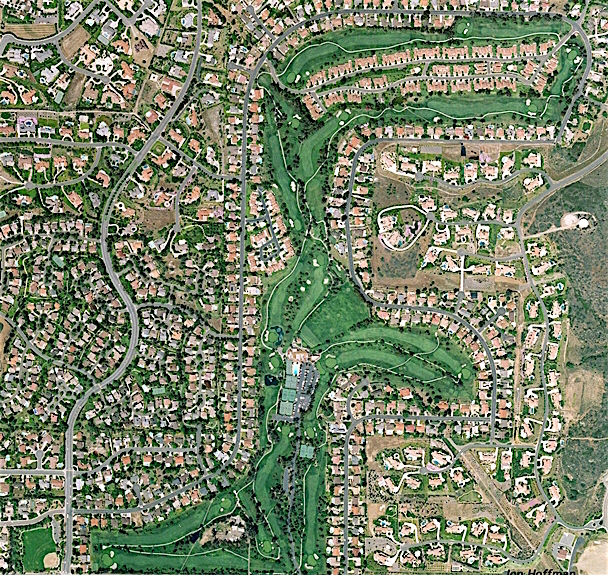 Schlesinger bought Poway’s bankrupt StoneRidge Country Club in December. He wants to poll residents about allowing him to develop some of the property. Schlesinger proposes giving the golf course and perhaps other features to the city of Poway to get the job done. Comparing the proposal to taking away a box of cute kittens without regards to feeding them later, Poway officials don’t seem to want it. San Ramon in the San Francisco Bay Area is almost 500 miles from the closer-to-home Poway, but that community is facing similar Schlesingerian measures and the natives were restless. Schlesinger and partner Ronald Richards, a Beverly Hills attorney, recently followed the Escondido Country Club playbook and suddenly, without warning, took action. They closed the San Ramon golf course pool on April 20, leaving the poor old San Ramon Aqua Bears youth swim club out of the water and out of luck. San Ramon CC homeowners said this was in retaliation for city officials saying they didn’t want any more houses built on the property as Schlesinger proposed. Remember when? Escondido Country Club fairway, left, home landscaping, right. 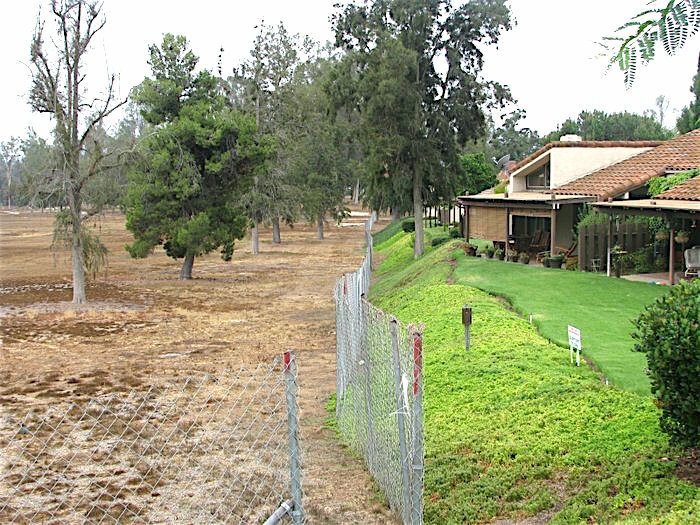 Schlesinger, bought the struggling Escondido Country Club four years ago, closed its golf course and announced plans to develop new housing there. A battle royale arose that included dueling ballot measures, lawsuits.and even the dumping of raw chicken manure on the golf course much to the revulsion of residents. Schlesinger’s Stuck in the Rough LLC paid a $100,000 fine to air quality control officials over the manure dumping. However, Stuck in the Rough and the city of Escondido reached an agreement earlier this year to drop competing lawsuits so long as another developer was allowed to develop a smaller portion of the Escondido CC land. Into the breach charged New Urban West, a favorite among Escondido officials. Under agreement with Schlesinger, and applauded by city officials, New Urban West is developing a scaled-down housing proposal. Et tu’ San Ramon Country Club? 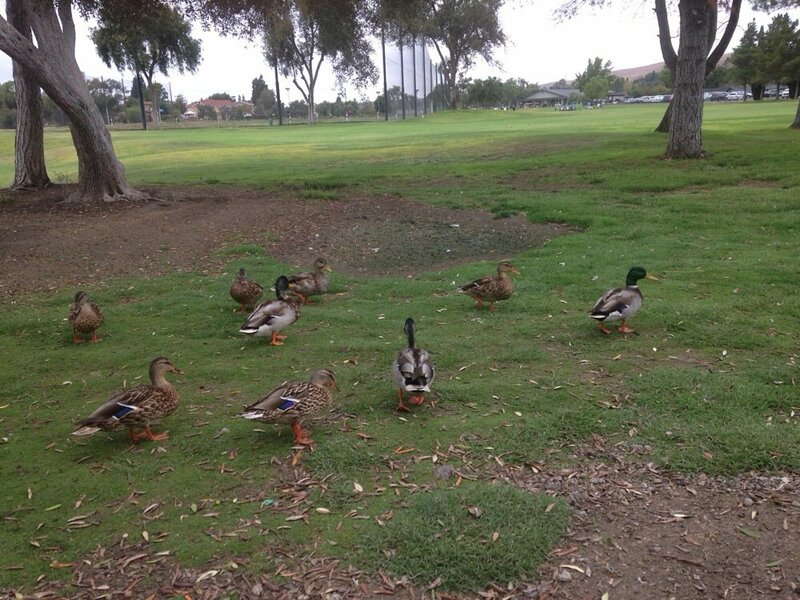 Da ducks at San Ramon Country club. Schlesinger and his Tree City LLC company bought the San Ramon club in December for approximately $8.1 million. They pulled the plug on the pool without warning. “The sudden closure of a swimming pool, forcing a youth swim club to find a new home, may be the beginning of a battle over the future of a local golf course, and whether houses will be built there,” Sam Richards of the Bay Area News Group said. San Ramon residents called the pool closing “cold-blooded” among the printable comments. “What we fear is that if they don’t get their way to build their houses, (Schlesinger) will simply put a chain-link fence around the course and let it all go to blight,” Michelle Hemenway, a golf course house resident since 1998, said. Griffin’s email said course owners want to sell a small portion of the 18-hole course on Fircrest Lane to a developer who would build houses there. The city’s initial rejection of those plans, he said, meant the pool — and most likely the golf course — can’t be kept open. San Ramon Councilman Dave Hudson said: “I’m telling people, ‘You’d better be prepared to hunker down,’ that this could be an ongoing battle,” adding, he told Schlesinger’s people he would never vote to rezone the course from golf course-specific zoning to residential. That would need four-fifths approval of both the San Ramon City Council and the city’s Planning Commission, he said. Now, on to StoneRidge CC. The StoneRidge course has been in operation since 1962. Schlesinger purchased the property in 2013 after it fell into foreclosure. He has been trying to sell it since early year without success. Many residents received phone calls from a pollster last week asking how they would feel if part of the property was developed while a majority of the land is given to the city for the possible operation of a 9-hole golf course or for park land. A majority of Poway voters must approve a plan to develop the property, according to Poway’s Proposition FF, approved by voters in 1988 to contain urban sprawl. Schlesinger sent an email to the city last week laying down the law. A recent city report, along with golfers, said golf course maintenance, and other features, had been poor the last two years. Everything required improvement, according to the report. Sound familiar, Escondido Country Club fans? Annelise Frederiksen plays through at Woods Valley G.C. Be the first to comment on "Escondido Country Club ghosts rattle Poway, San Ramon developments"